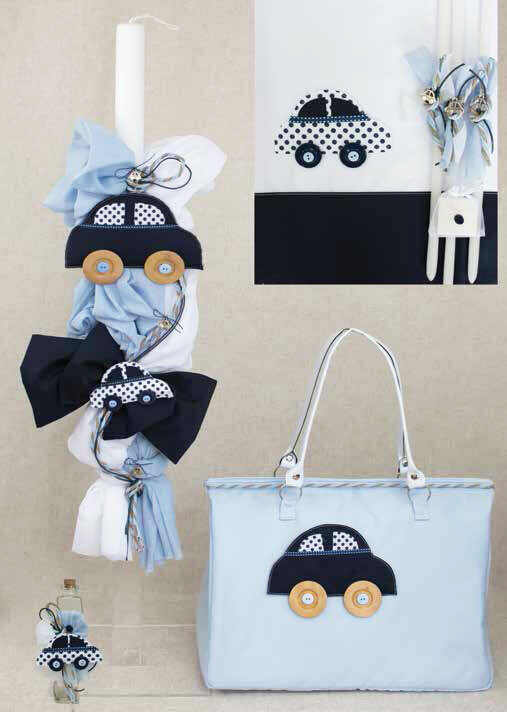 A stylish baptism set for your little baby boy with a car theme. Beautiful baby carriages are tied on the candle with fabrics and cords in beautiful colors of dark blue, baby blue and white. The same decoration is available in towels, in the bottle of oil and in the light blue bag that accompanies it. The set includes: a candle, a large suitcase, three candles, a soap, a bottle of oil, a lapel, lingerie and towels. https://www.preciousandpretty.com/2018/07/greek-christening-lampada-set-with-car.html Greek Wedding Favors|Orthodox Crowns|Stefana|Baptism Invitations Greek christening lampada set with car E805 Christening lampada set for boys, with beautiful cars on. Product #: Greek Wedding Favors|Orthodox Crowns|Stefana|Baptism Invitations_5385602484491555117 5 stars out of 5 reviews.